On this day in 1525, Nicholas Storch died, at the height of the revolution he helped to inspire: The German Peasants’ War, an uprising by laborers against the feudal system. Storch was a radical. A weaver, he became a preacher of anarchist Christian views. He spread his ideas of the equality of all human beings and a communal sharing of goods and work. Unlike other members of the Zwickau Prophets, Storch was not a pacifist. He felt only direct confrontation and an uprising of the workers against the ruling class would result in bringing about the better world of his vision. During the 1524 harvest in Stühlingen, the Countess of Lupfen ordered serfs to collect snail shells for use as thread spools. This was the final straw in a series of difficult harvests, and within days, 1,200 peasants had gathered, created a list of grievances, elected officers, and raised a banner…within a few weeks, most of southwestern Germany was in open revolt. Conditions were ripe for revolution. German coins had been devalued by the importation of silver and gold from Latin America. Prices rose, but rulers refused to lower their lease costs or allow the guilds to raise wages. Taxes on serfs and villagers were increased as well, because the rulers did not want to absorb the cost of a new imperial tax for the Holy Roman Emperor. The peasant class was forced to bear the brunt of these economic disasters in addition to ridiculous demands from their feudal lords. As news spread of each local uprising against the serf status, more followed. Workers were fighting against well-funded and highly trained military forces: each ruling prince was required to keep a standing army and provide weapons for his soldiers. The farmers and craftsmen could not afford horses, armor, or weapons. 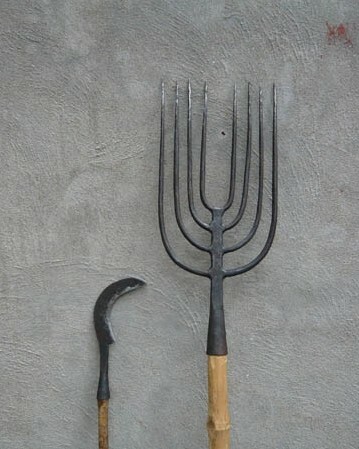 So they used pitchforks, scythes, wooden staffs, torches, and rocks. The ruling class expected these rock-throwing rebels to last a few days at best. Instead, the uprising turned into a war that lasted two years. The serfs had two advantages. One was their solidarity, and the other was their ability to work hard physically to prepare for battles. They were able to build excellent trenches and field fortifications quickly. They linked their wagons together into a makeshift fort, and surrounded it with ground defenses. The princes’ armies had to split their forces to attack all sides. Bands of disconnected peasants became, with the help of Storch, Thomas Müntzer, and other advisors, an effective army. Each band elected its own officers. Everyone had input in strategies and decisions, but captains made the final decisions. 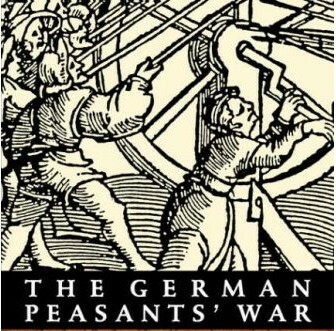 At the peak of the Peasants’ War, over 300,000 serfs and villagers were fighting across the German feudal states. By the time Nicholas Storch died, it is likely that he and Thomas Müntzer had worked on drafts of The Twelve Articles, a list of demands that the peasant army presented to their rulers. When we read this list today, the concessions sound modest. The workers and villagers wanted to choose their own pastors, to fish and to hunt small game in the woods, to collect firewood to heat their homes in the winter. They wanted fair rents and taxes, and a return of their right to common grazing land—which they previously held, but were taken away by feudal rulers. And they wanted a voice in how they were governed. But the rulers were stunned that their serfs, who they regarded as possessions, would make any demands at all. It was as if, one prince wrote, the farm animals demanded a new barn or the crops complained that they didn’t have enough water. The fighting continued. By May of 1525, the Peasants’ Army was celebrating major victories across the war region. They had captured and gained control of several cities. Some Catholic bishops, along with the Elector of the Palatinate and a few of the princely counts, approached the peasant army and offered concessions. They also promised to meet the army’s Twelve Articles. Then the Peasant Army made a critical error: it took these rulers at their word. Leaving a small standing army, thousands of peasants were sent home to attend to their fields and crops. A battalion of fighters and a band of councilors convened at Frankenhausen to draft a new constitution for the empire, allowing votes for the peasants. At this point, Martin Luther urged the feudal princes to destroy the “murdering and robbing band of the peasants.” Nicholas Storch’s comrade Thomas Müntzer was captured, tortured, and executed while working on the constitution. He was 28 years old at the time of his death. Saxony fell back under the rule of the Saxon princes. Defeats followed in Alsace, Württemberg, and Würzburg. …gained not only relatively, through the weakening of their opponents, the clergy, the nobility and the cities, but also absolutely through the prizes of war which they collected. The church estates were secularised in their favour; part of the nobility, fully or partly ruined, was obliged gradually to place itself in their vassalage; the indemnities of the cities and peasantry swelled their treasuries, which, with the abolition of so many city privileges, had now obtained a much more extended field for financial operations. 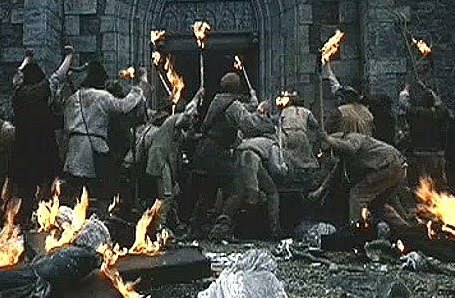 There would not be another uprising of the working class to match the Peasants’ War until the French Revolution, 264 years later. Very good article. Just a small correction: The quote is by Friedrich Engels. It was published in the joint volumes by Marx and Engels (vol 7), which is probably the reason for the misattribution. Storch didn’t died in munich in 1525 according to the Mennonite Encyclopedia (http://www.gameo.org/encyclopedia/contents/storch_nikolaus) and Sächsische Biografie (http://saebi.isgv.de/biografie/Nikolaus%20Storch%20%28vor%201500-nach%201536%29). He appeared in 1536 for the last time on the Zwickau Council minutes. There are sources for the article that are hyperlinked in green. Beyond that I can’t help you as the person who wrote the story passed away earlier this year.